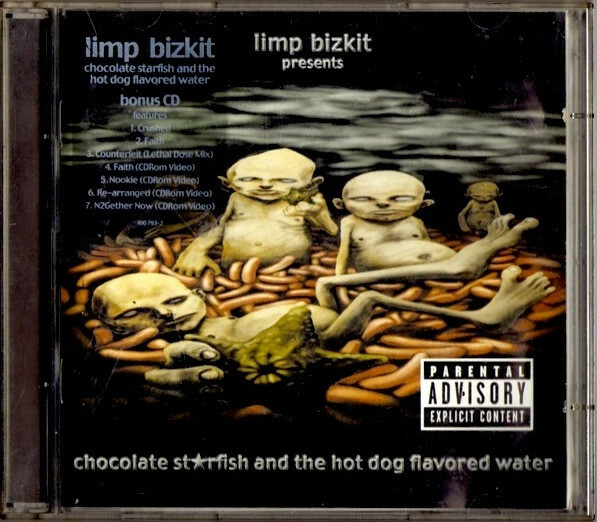 Years ago, when Limp Bizkit was a thing for a lot of people, Fred Durst and company decided to name one of their albums "Chocolate Starfish and the Hot Dog Flavored Water." The album cover is fairly awful and a bit disgusting. I'm not sure what's going on with the "chocolate starfish" in that picture, but I have a few ideas, and I'm not really interested in pursuing them any further. Now I'm going to go out on a limb and assume that the band didn't include "hot dog flavored water" in the title of their album in an attempt to entice prospective CD buyers by invoking a sense of deliciousness. I'm fairly sure repulsion is exactly what they were going for. 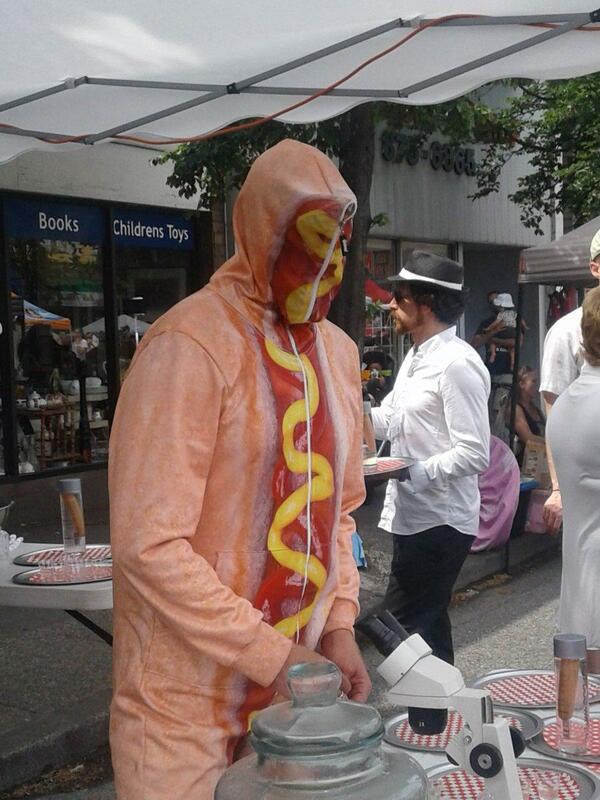 So imagine the surprise many people felt when they learned that Hot Dog Water is now being sold at the annual Car Free Day festival in Vancouver, Canada. And it's $37.99 a bottle. In case you were wondering what such a ghastly-sounding and seemingly overpriced product would look like, well, here you go. If you think your eyes are deceiving you, I assure you, they're not. 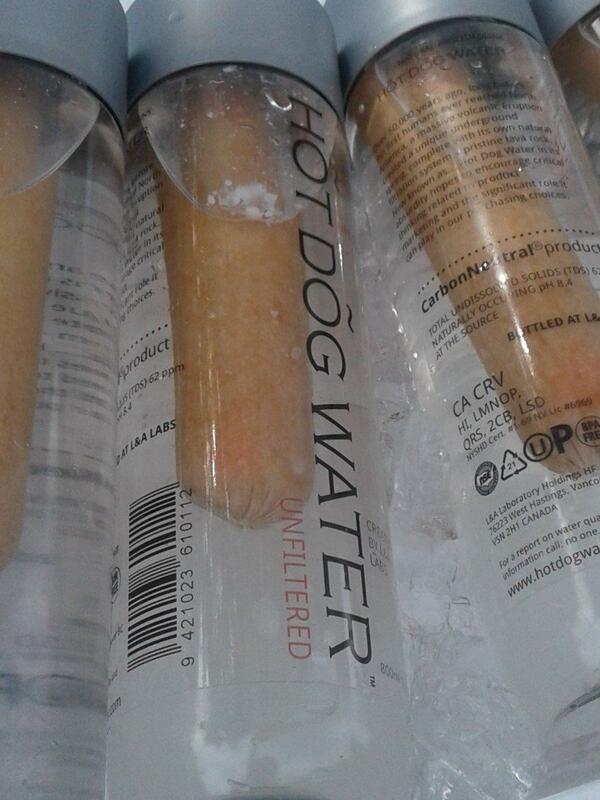 That's literally a bottle of Voss-looking water with a hot dog floating around in it. 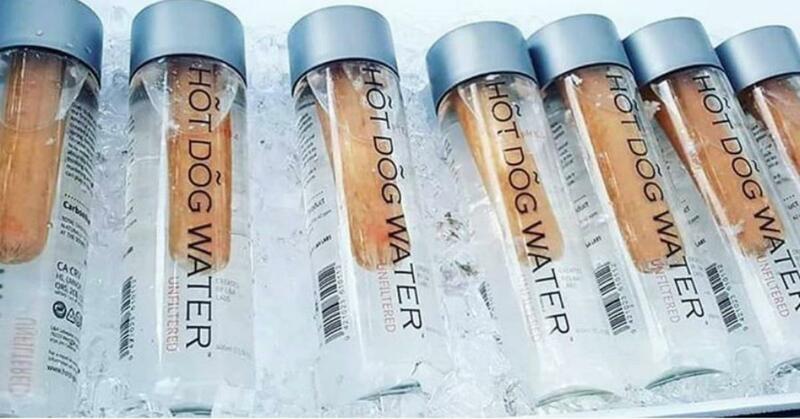 The best part about the Hot Dog Water is that there a bunch of health claims associated with the product that aren't the immediate evacuation of whatever's in your stomach through your mouth. 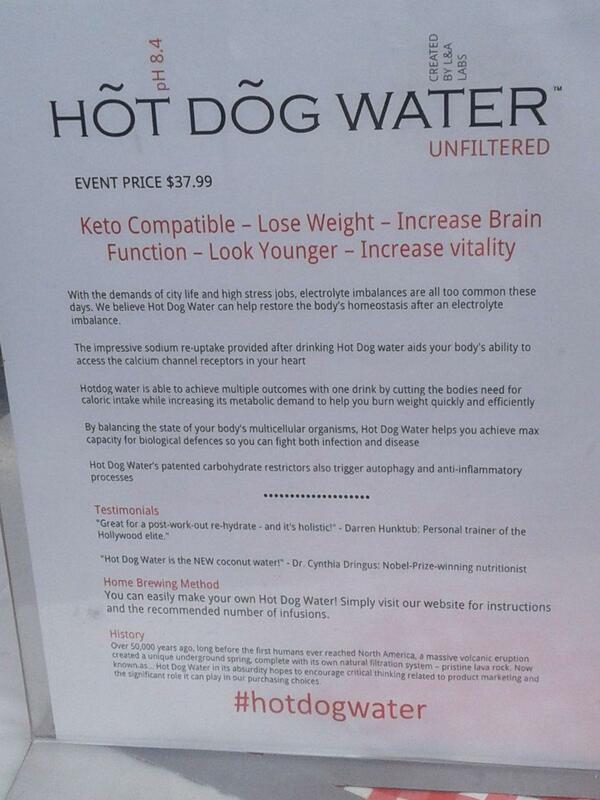 "Improved brain function," "increased vitality" and a "younger" look can all be yours if you slurp on some water with a hot dog floating around in it, apparently. Upon seeing the stand selling the "revolutionary" new beverage, festival goers couldn't decide whether it was an elaborate joke or an actual product designed for human consumption. 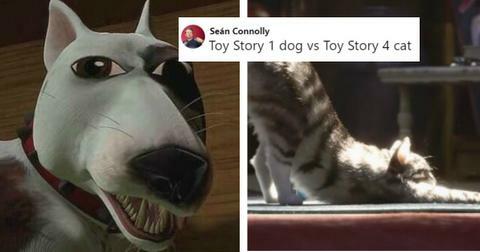 Which was really the question on everyone's minds. There were quite a few people who thought the water was a legitimate health food product. "We've created a recipe, having a lot of people put a lot of effort into research and a lot of people with backgrounds in science really creating the best version of Hot Dog Water that we could." "there's a fair bit of it that is too science-y for me. So the protein of the Hot Dog Water helps your body uptake the water content, and the sodium and the things you'd need post-workout." However, a closer look at Bevans' display quickly revealed that he was, indeed, not entirely serious with his product. last line gives it away "hot dog water in its absurdity hopes to something something critical thinking"
Bevans, a tour operator and artist, said that he came up with the idea while thinking up a way to comment on "snake oil salesmen" in the health industry. It seems that everywhere you turn, there's some type of suspicious-looking health craze like gem-infused water or the potentially life-threatening "Raw Water" looking to charge you premium prices in the hopes of making you believe you'll attain perfect health nirvana. 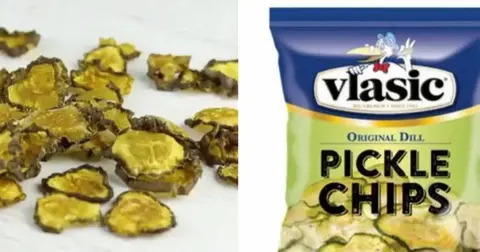 "It’s really sort of a commentary on product marketing, and especially sort of health-quackery product marketing," Bevans said. "From the responses, I think people will actually go away and reconsider some of these other $80 bottles of water that will come out that are ‘raw’ or ‘smart waters,’ or anything that doesn’t have any substantial scientific backing but just a lot of pretty impressive marketing." 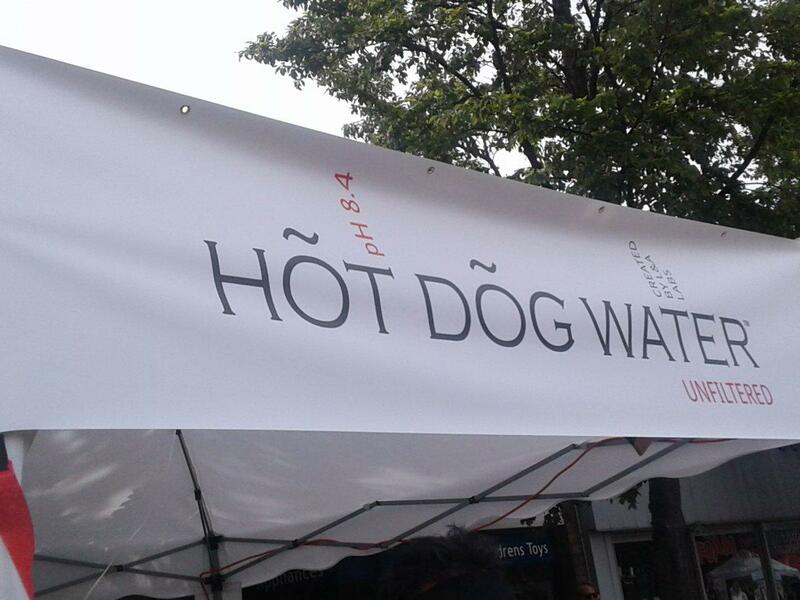 Even though the Hot Dog Water was a stunt, people still bought and drank it throughout the day. "They've been drinking it for hours. 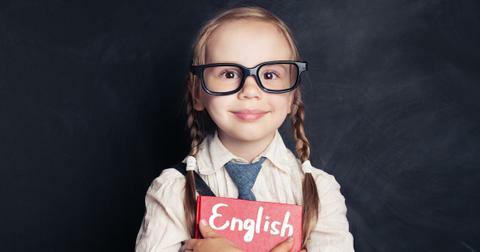 We have gone through about 60 liters of real hot dog water," Bevans said. Sounds like he's well on his way to recouping the $1,200 he spent on branding, bottles, and labels for his art stunt. Along with the Hot Dog lip balm, breath spray, and "body fragrance." Man, he went all in.